The Derry City Walls, or the walls of Londonderry (the name, like everything in "Stroke City," very much depends on which side of the divide you see yourself to stand), are one of, if not the, most iconic urban sites in Ireland. The walls tell the story of Northern Ireland's are a living monument to the "Troubles" and are rivaled maybe only by Dublin's General Post Office for historically important Irish structures. After having been closed to the public for decades, mainly due to their utility as an ideal vantage point for snipers and the odd stone-throw, the peace process has allowed them to become Derry's most visited attraction. Surrounding the old city center of Derry, the city walls are an original and astoundingly complete 17th-century urban fortification with amazing views. You will almost always look down on something, as the walls are not only high in themselves but also straddling a hill. Add to that the opportunity to literally take a walk through Irish history, as this is one of the most iconic urban sites in Ireland and holds a strong connection to the history of Northern Ireland. Having said that, the walk can be slightly depressing on wet and foggy days, when all is gray and there is not much of a view. The Derry City Walls were completed in 1618 and mainly planned as a defense of the prosperous city against Irish raiders from Donegal. They are up to 26 feet high and up to 30 feet wide, enclosing the old merchant city. The walls earned their immortal place in Irish history through the defiance of Derry's Protestant apprentice boys, whose slamming of the gates in the face of an approaching Catholic army made the Walls of Derry an iconic emblem of Loyalism and Unionism. The Derry City Walls are a must when you are visiting the "Maiden City" (so-called because her defenses were never breached). 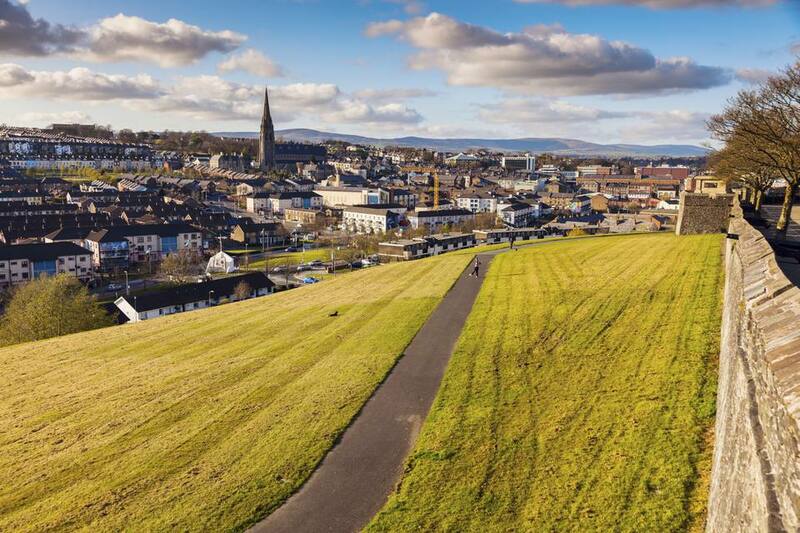 Derry is not that blessed when it comes to beauty spots, but the history of the city and the buildings connected to it make it a worthwhile visit. If you discount the city walls, Derry is one of the few cities in the British Isles fortunate enough to retain its complete town walls, sturdily protecting the town, burghers, the rule of Protestantism. The Walls of Derry gained instant fame within the Protestant church when the town's garrison was about to surrender to King James' forces in 1688. During this episode of the Williamite Wars, the approaching army looked a sure winner and the soldiers tasked to defend the city decided to hasten the inevitable, therewith gaining a few concessions. Or so the plan went until the more firebrand variety of local Protestantism galvanized a motley crew of apprentice boys who, with a resounding cry of "No Surrender!," took charge of the gates and slammed them shut. The boys blocked the gates against the enemy and thus started the Siege of Derry. The Siege of Derry is one of the defining moments of Ulster—and Irish—history. Today you can walk the length of the walls and witness views of a still divided community, despite years of the Peace Process. You may look down into Protestant areas that proclaim to be "still under siege" and you might see a still somewhat fortified police station almost cheek to cheek with the cathedral. An unassuming church has photographs of the destruction after an IRA bomb sent a pillar crashing through its roof. From a battery upon which cannons still stood fairly recently, you can look down on "Free Derry"—the Catholic Bogside. This was the scene of many disturbances, including the massacre that was "Bloody Sunday," when British paratroopers opened fire on a Civil Rights March. With all this recent history in plain view, it is small wonder that few visitors seem interested in the fortifications themselves. The distinctive outline of a walled town is, however, still traceable, so take your time to do so. The Walls of Derry are definitely recommended for a stroll into Irish history. They are generally open during daylight hours and quite safe to walk—just don't do any climbing. You may want to join a guided walk, which can be arranged through the tourist information center if you want more background information.